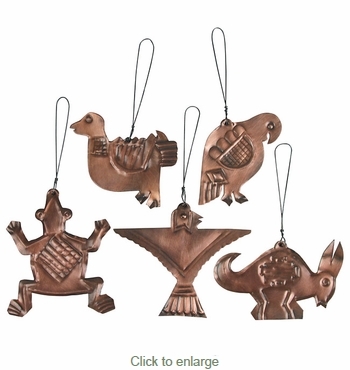 These small aged tin Mimbres style ornaments are a perfect way to incorporate native Mexican culture into your special occasion or holiday decorations. These unique ornaments are all hand cut, punched, and etched by talented folk artists in Mexico. This set of twelve mimbres ornaments work wonderfully on a Christmas tree and they also make great gifts for friends and family. Expect some variation in size and color with these uniquely designed tin ornaments.